Ask fellow campers about "Kankakee South KOA" and nearby attractions. We needed a one night stay and washer/dryer traveling from southern IL to family north of Chicago. We asked to be moved to a site that we wouldn't have to unhook. They moved us graciously. The site was not level, was grass and sand. It worked. 4 washers and dryers, $1.50 each, no change machine. Office closes at 7pm. No grills, only fire pit. Sites are very close together. Neighbor's sewer is literally a few feet from your picnic table. No interest in eating outside. Bathrooms have spiders. Nice enough fixtures and private showers. Staff was very nice. Wifi didn't work. Asked staff and was told maybe/maybe not.... We came for laundry and wifi. Oops. We camped at Kankakee South KOA in a Tent Trailer. Plan to cook and eat inside because of sewer issues. Fire ring was very close to neighbor. Staff offered to deliver wood, but we declined. Site was not level, needed to raise one side about three inches. Water pressure was sporadic. Bursts of water from sinks. First time we saw this! Quiet location. Ok for a night, but will not likely stay again. We will regularly travel to Chicago, but that was expensive for the issues. One of the nicest KOAs we have stayed in. Other reviewers compared the park to a state park and I would have to agree. Out in the country so it is very quiet with many big trees. Can't use satellite for that reason. Sites are well spaced for a KOA. Staff is extremely helpful and friendly. We needed a little help with a tree issue when we pulled into our site and Dakota stayed with us until we got it solved. People in the park are so friendly. We would definitely return. 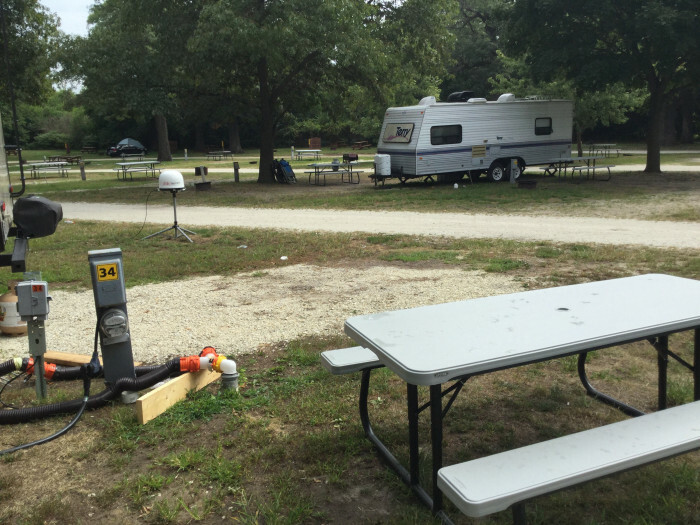 We camped at Kankakee South KOA in a Fifth Wheel. The state park in the area was closed so we stayed here to visit relatives on the way west. The employees were friendly and gave us an upgraded site because of some work being done in the park. This is a relatively small campground. The entrance to the park is not well marked. Our site was shaded and had room for our motorhome and towed vehicle. The bathrooms and showers were clean but were out of date. I would stay here again only if state park was still closed. We camped at Kankakee South KOA in a Motorhome. Nice wooded park with good size sites. It felt much like being in a state park. Wifi mostly worked well except at times when everyone wanted to be on it. Had to work at getting satellite dish in good location. Others had tv antennas up. Watch for low branches in some sites. Our first site had a large branch we did not think we could get under so they gave us another site. No road or train noise. We camped at Kankakee South KOA in a Motorhome. Close to Kankakee for shopping and dining. Campground was very easy to find, about 3 miles off interstate. There are a variety of different campsites available. Our site was a nice size. There were trees around to make it more than an RV "parking lot", but not so many that satellite was impossible. They have sites that easily handle big rigs. There was plenty of room in our site for the truck, 5th wheel and jeep. Well maintained roads through the campground. Good Verizon coverage. We had good DirecTV satellite-but the manager made sure we knew it might not be a good signal. We will absolutely plan to stay here when we are in the area. We camped at Kankakee South KOA in a Fifth Wheel. Spent one night here because of the easy off/on to the interstate, to break our journey. Nice, quiet park. Escorted to our site, a level concrete pad with hook-ups easily accessible. The laundry facility was good and the pool clean. 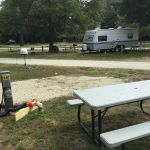 We camped at Kankakee South KOA in a Travel Trailer. My wife and I stayed the weekend at reserved site 43. 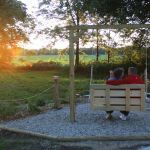 I was definitely pleased, as most of the campgrounds we've been to do not offer concrete pads. The overall stay was pleasant and very quiet. No problems with rowdy neighbors or uncontrolled kids. The pool, although small was definitely refreshing on a super hot day. The camp store had all the must haves, including ice cream, which is always great! The only reason I can't give a higher score is because of the really slow WiFi and lack of cable hook up. These are only minor annoyances though. My speed test on the network came back at 2.5 down and 2.0 up. Awesome for email, but you definitely won't be streaming movies anytime soon. A note on the water quality: I've seen numerous reviews cite the water as a concern being that it's too sulfuric. My grandparents always lived in rural Indiana and their water always tasted similar, so it's not really a big deal for me. Is it Evian spring water? No. Just normal well water that I doubt will cause any problems other than overreacting. 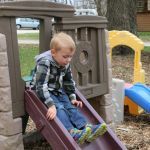 We camped at Kankakee South KOA in a Travel Trailer. Quick overnight stop. Laundry room worked great--reasonably priced. Verizon wifi connected fairly well here. 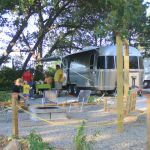 We camped at Kankakee South KOA in a Travel Trailer. Nice for our one night stay. Good wide spaces and staff was helpful. We camped at Kankakee South KOA in a Motorhome. Good spot to stay on our way to Chicago. We originally booked a one night stay, but truck trouble required us to stay another two nights. Our first night was a Saturday and the park was nearly full, with many families and children. However, on Sunday the majority of campers left and the park was revealed to be a very pleasant place, with large shade trees and grass. Bathrooms and showers were a bit dated but clean. Water was clean and the pressure was good, but it had a sulfur odor. Our gravel site contained a lot of sand which was particularly sticky and seem to track everywhere. Staff were helpful. The nightly rate listed is for full hookup, 50 amp, pull-through. We would certainly be willing to camp here again. We camped at Kankakee South KOA in a Fifth Wheel. We received good emergency service from Taylor Ram in Bourbonnaise, about 13 miles north of the campground. Very tight for RV's, they were packed together. Water smells of sulfur. Dirt and light gravel narrow roads. Overnight stop ok but not sure why there were so many people here, but beats spending on a hotel. Bathrooms ok but a little on the dirty side, but again the place was full. We camped at Kankakee South KOA in a Tent. The clerk led us to our campsite via a golf cart. The site is fairly tight with about 2 feet of space on each end of our 36' motor home and tow. The roads are gravel and fairly narrow, but we were able to navigate easily enough. There is no wifi or cable. We were able to pull in several TV stations using our antenna and we had an adequate Verizon wireless signal (better data signal than voice). There is a very nice and clean dog run. The park is well maintained and clean. There is little road noise as the park is quite a distance from any major roadway. We overnighted here while traveling south on I-57. We would overnight here again. We camped at Kankakee South KOA in a Motorhome. We stayed at this KOA in August as we were visiting friends in the area. The KOA is close to I-55 and is convenient to Chicago (approximately 1-hour north). The Kankakee River State Park is nearby where one can rent horses and go horseback riding on the trails. Entrance/exit to this KOA is tight, so use caution. Interior roads are dirt and the campground workers were working on interior road improvements while we were there. Hopefully the interior roads are better now. The park is small and the sites are rather close together, not all that level, but are long for big-rigs/toads. Amenities offered are fire rings, Wi-Fi, garbage pick-up at site, swimming pool, playground, basketball and volleyball courts, laundry room, propane filling station, restrooms, and game room. Staff at this KOA are awesome! We stayed here for a total of 4-nights in our Class A motorhome. We camped at Kankakee South KOA in a Motorhome. This KOA is located well off the beaten path and was probably the best value KOA we found during this year's travel season. It is an older park, with a mixture of site amenities (Full Hook-up, Water/Electric, "Tent"). Interior gravel roads are a little tight and you have to be careful for trees and limbs. We arrived after a very rainy spell and there were huge puddles and soft spots in the roads near the office, but more gravel was spread while we were there. The sites are simple but reasonably spaced. We were able to (barely) get our large motorhome and towed vehicle into our space without blocking the road. I ended up backing out of our pull-thru for departure, as cars parked in nearby sites made it tough to exit our space. WiFi was essentially unusable but we did get a satellite TV signal through the trees and VZW 4G was reasonably strong. There were quite a few perma-rigs but they appeared to be more seasonal campers as opposed to residents and most were kept up. Things were pretty quiet, although I suspect it may be more lively during weekends and better weather. 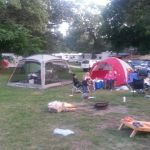 We camped at Kankakee South KOA in a Motorhome. Very difficult to maneuver a 44ft fifth wheel - not very wide roads and sites are tight to pull in and out of. Water tasted and smelled horrible - wish we had filled up or fresh water tanks before staying here. There are very few 50amp sites and they seem to go quickly. We stayed here overnight on our way through Illinois traveling to Memphis. I will pick a different campground next time. We camped at Kankakee South KOA in a Fifth Wheel. Are you affiliated with Kankakee South KOA ?